Hi there! It’s time for another edition of “What to Wear Wednesday”. Since ankle boots are here to stay, we thought we would look at 3 distinctive styles and how we would wear them. We know the days don’t quite feel autumnal yet, but it will be here sooner than you know it. 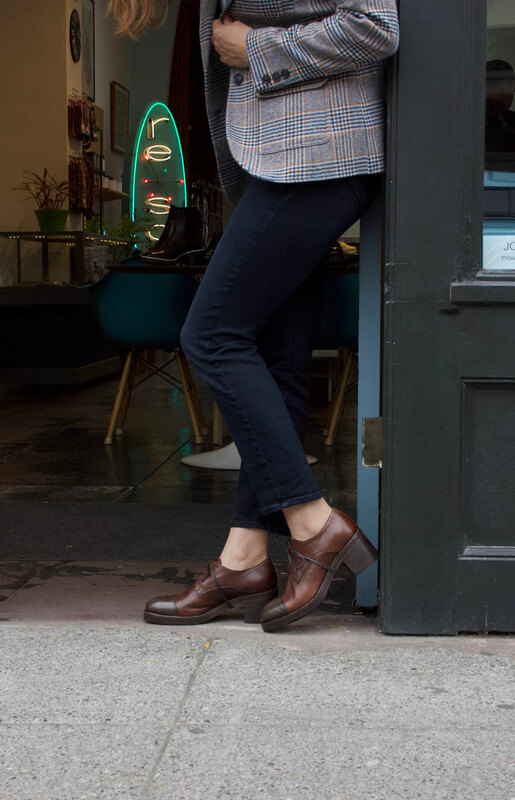 Whether you want to go more casual or more polished, we have some examples that are sure to fit into your personal style for this Fall. As an every day, walk around town, kind of boot, we like the classic flat lace-up boot. These are versatile enough to wear with everything. Especially if you are a jeans and t-shirt kind of gal. We would wear these with our skinny jeans and a comfy sweater. But feel free to wear them with longer skirts and shorter dresses too. Sometimes getting around during the day is much easier when you are not teetering on a high skinny heel. You can be perfectly comfortable walking to the bus, on your way to work, while still looking pulled together. Besides, blocky mid heels are totally on point and on trend these days. Although these would work with skinny jeans too, we think to style them with a skirt is a fantastic option to your basic pump. When the days become crisp, add some opaque tights and you are good to go for the cooler months ahead. Everybody has a black ankle boot in their wardrobe, right? We love the clean simple lines of these tall heel ankle boots but, it’s all about that green color! These would look amazing with dresses and skirts. We, however, like these forest beauties with wide leg trousers. Add a turtleneck top to balance the look of the pant leg and viola, you have an instantly chic outfit. What’s your favorite way to wear ankle boots? We’d love to know. For more ankle boot options shop with us at resoul.com. All boots sold at resoul.com. Photos by re-souL, sketches by Maggie Burns.